« Beautiful 4th of July! Weather forecast says highs tomorrow will be in the upper 70s! Thursday could be mid to low 70! What month is this? Wow! Looks like some nice cool weather ahead. Also have (still) slight chances of rain through the weekend. Same old, same old generation schedule. Nothing in the mornings, then coming on from 1:00 p.m. or after. Generation for 5-6 hours then off again until the next day. Fishing continues to be up and down. Darrell on the water last Wednesday with Shannon from Kansas. Caught a few fish, but certainly not a bang up day. The ruby midge was their pattern. Stan had Taisha and her father, Jim out for half a day. They managed to find quite a few fish stripping the holographic green crackleback. out for half a day. Carolyn had Melissa and Scott. 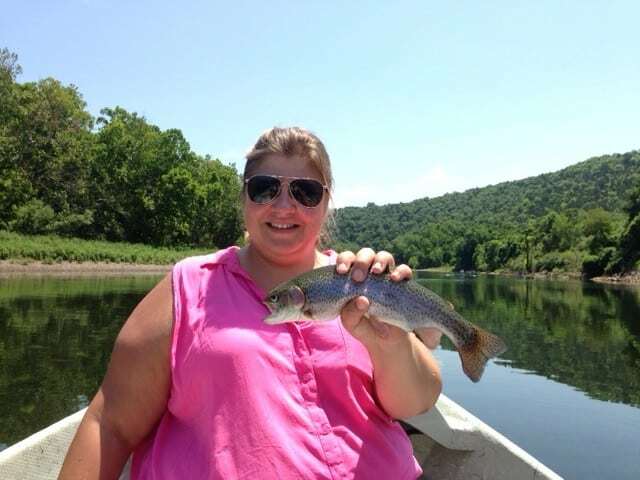 This was Melissa’s first time fly fishing and glad to say she did not get skunked! Best pattern, if you can say that, was the P&P. 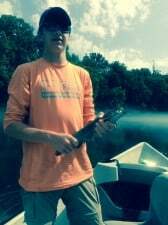 Darrell took Corey and Jack, They fished the copper dun and P&P midges. And, bringing up the rear was Stan with William and Scott. P&P and egg pattern were their patterns for the morning. Saturday, Carolyn took Dawn, aka, “The Stripper” out for the day. Really slow start in the a.m. We were below the root wad for a while in the morning and saw two fish caught. Lots of fishers and not many fish being caught. Late morning we started hooking a few fish on the P&P, but after the first unit came on and we found the right color bugger, it was wonderful stripping a ginger wooly bugger. Third unit on, we move locations and started catching on the CQ streamer under a 3.9 ips sinking leader. Finished off the day with a size 16 bead head hare’s ear under a size 16 red midge and drifted the high bank across from the Pointe. Lost two good size fish and landed a nice, really fat, 16 incher. Too bad he wasn’t as long as he was fat! This entry was posted on Monday, July 14th, 2014 at 1:34 pm	and is filed under Fishing Reports. You can follow any responses to this entry through the RSS 2.0 feed. You can leave a response, or trackback from your own site.